Associate Professor Peter A. Jackson, Senior Fellow in Thai History, Research School of Pacific and Asian Studies, Australian National University. สำนักวิจัยด้านเอเชียและแปซิฟิก มหาวิทยาลัยแห่งชาติออสเตรเลีย Dr Narupon (Toon) Duangwises, Head of the Academic Department of the Princess Maha Chakri Sirindhorn Anthropology Centre (SAC), Bangkok. Dr Carolyn Brewer, Gender Relations Centre, Research School of Pacific and Asian Studies, Australian National University. Editor, Intersections: Gender and Sexuality in Asia and the Pacific. ดร.แคโรลีน บรูเวอร์ ศูนย์ความสัมพันธ์แห่งเพศภาวะ สำนักวิจัยด้านเอเชียและแปซิฟิก มหาวิทยาลัยแห่งชาติออสเตรเลีย บรรณาธิการ วารสาร Intersections. Figure 1. 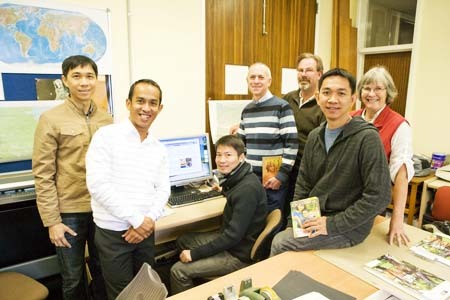 The Thai and Australian project teams in Canberra. From left to right: Narupon Duangwises, Paul Brugman, Samanluk Bunrak, Carolyn Brewer, Peter Jackson, Nikorn Chimkong and Paratthakorn Nimsang. Figure 2. Training Day at the National Library of Australia. 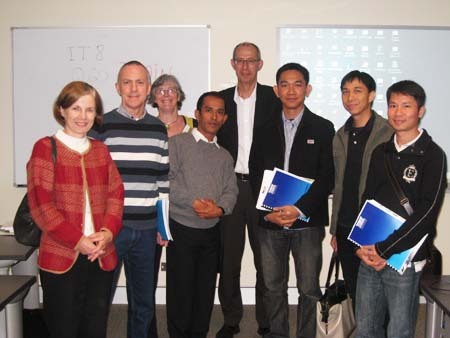 From left to right: Amelia McKenzie, Peter Jackson, Carolyn Brewer, Samanluk Bunrak, Andrew Stawowczyk Long, Nikorn Chimkong, Narupon Duangwises and Paratthakorn Nimsang. Figure 3. 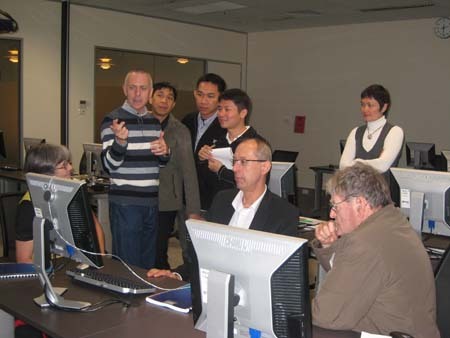 In the computer laboratory of the National Library of Australia. Carolyn Brewer, Andrew Stawowczyk Long, Ian Henderson. Standing: Peter Jackson Narupon Duangwises, Nikorn Chimkong, Paratthakorn Nimsang and Saowapha (Sophie) Viravong. Figure 4. Learning about FileMaker Pro in Paul Brugman's office at the Australian National University. Front, left to right: Narupon Duangwises, Samanluk Bunrak, Paratthakorn Nimsang, Nikorn Chimkong. Rear: Peter Jackson, Paul Brugman and Carolyn Brewer. Figure 5. More work on the data-base. Narupon Duangwises, Samanluk Bunrak, Paratthakorn Nimsang, Nikorn Chimkong, Peter Jackson, Paul Brugman and Carolyn Brewer. Figure 6. 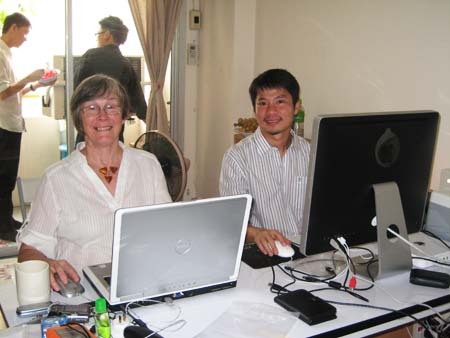 Carolyn Brewer and Paratthakorn Nimsang in the Thai Rainbow Archive Project Office in Bangkok, Thailand. Figure 7. Paratthakorn Nimsang, Peter Jackson, Samanluk Bunrak, and Carolyn Brewer in the Thai Rainbow Archive Project Office in Bangkok, Thailand.